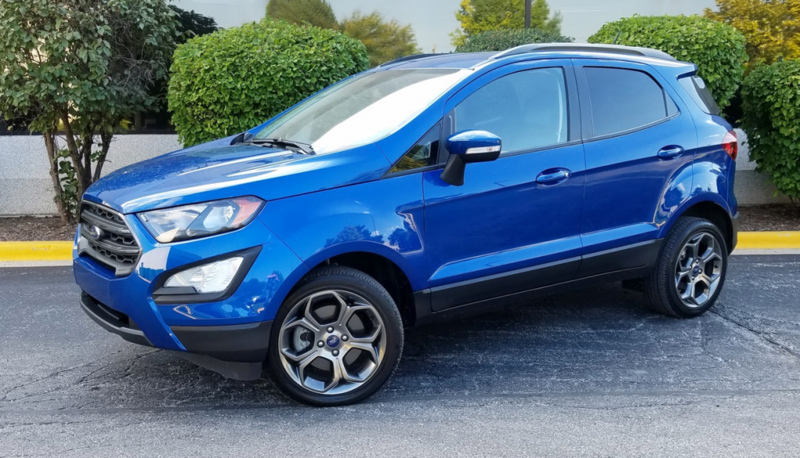 If, as suspected, the EcoSport is Ford’s way of getting its foot in the subcompact-crossover door until it can produce a class-contending clean-sheet design, may we suggest to the folks in Dearborn that they hurry? Considering what the EcoSport doesn’t have or can’t do, consumers in this expanding market slot are likely to shop elsewhere before Ford comes up with a creditable entry. The SES is the second-from-the-top model in the EcoSport lineup. Standard features include roof rails, rear park-assist sensors, a voice-activated navigation system, sunroof, and sport-tuned suspension. 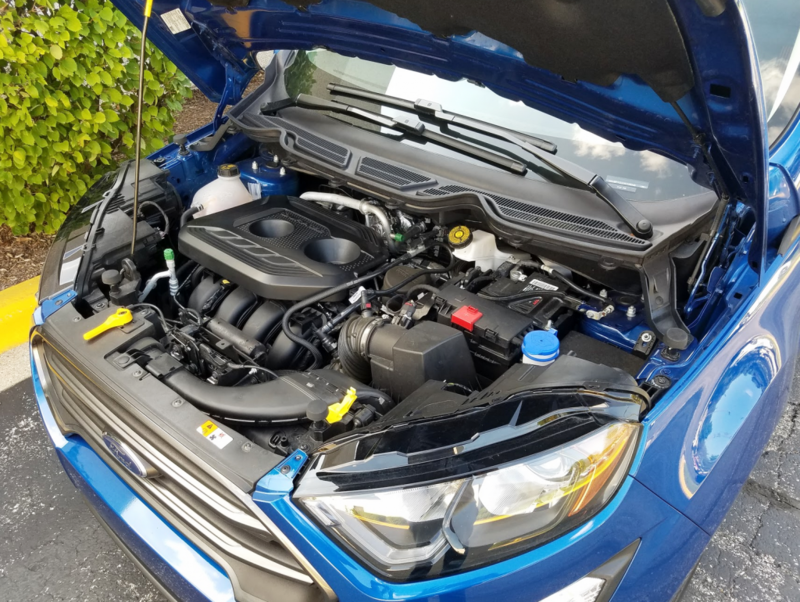 As Consumer Guide has noted in prior reports on the EcoSport, the little ute that popped up in U.S. showrooms for 2018 is actually an Americanized version of a vehicle that Ford sells globally (it is produced in India), and has for some time. Indeed, the current iteration has been on sale since 2012. In terms of ride, power delivery, and feature availability, it very much seems like Ford is just getting what it can from the existing EcoSport until something better suited to the U.S. market comes along. The copper-colored interior accents of the SES trim level help liven up the EcoSport’s cabin a bit. The all-around small dimensions mean that space for both passengers and small items isn’t particularly generous. Following its earlier test of a front-wheel-drive Titanium with a turbocharged 1.0-liter 3-cylinder engine, CG’s latest turn in an EcoSport happened in an all-wheel-drive SES with a naturally aspirated 2.0-liter four. (The 3-cylinder engine is reserved for FWD EcoSports, and the 4-cylinder is exclusive to AWD-equipped models.) Of the four available EcoSport trim levels, the SES is the only one solely with all-wheel drive; the others can be had with either drivetrain. The EcoSport is the only member of its class with a side-opening tailgate; compared to a traditional top-hinged liftgate, the side-hinged swing-gate requires additional space behind the vehicle to be opened fully. Cargo volume is decent, considering the extra-small exterior dimensions: 20.9 cubic feet with the rear seat backs up, and 50 cu. ft. with them folded. A step down from the top-rank Titanium, the SES starts at $27,735 with delivery. SES equipment consists of a sport suspension, “tarnish”-finish painted 17-inch alloy wheels, cloth-and-leather seats, copper-colored seat and dash accents and stitching, voice-activated navigation, a 4G LTE Wi-Fi hotspot, blind-spot and rear cross-traffic alerts, rain-sensing windshield wipers, and a 110-volt AC outlet. That builds on existing standard features including the Sync 3 infotainment system with 7-speaker audio, satellite radio, Apple CarPlay/Android Auto functionality, and an 8-inch touchscreen; rear obstacle detection; automatic climate control; keyless access and starting; heated front seats; 6-way power driver seat; tilt/telescoping steering column; leather-wrapped steering wheel and shifter knob; sunroof; fog lamps; roof rails; and tow hooks. The test car’s sole option was the Cold Weather Package with floor liners and heated mirrors, steering wheel, and wipers. A 166-horsepower, 2.0-liter 4-cylinder engine paired with a 6-speed automatic transmission is the sole powertrain for all-wheel-drive EcoSports. That may seem like just about everything a modern car buyer might need, and the Titanium adds leather upholstery and a stereo upgrade. However, there are some now-common driving aids that can’t be had on the EcoSport, even at extra cost: forward-collision warning and mitigation, lane-departure warning and mitigation, adaptive cruise control, and automatic high beams. The 166-horsepower 4-cylinder engine is fitfully paired with a 6-speed automatic transmission, neither of which seems happy in the other’s company. Torque is listed as a not-half-bad 149 lb-ft at 4500 rpm, but the SES crawls at first press of the accelerator, then jolts somewhat to life, as if experiencing turbo lag—except there’s no turbocharger. Automatic shifts are seemingly all over the place, and often impossible to ignore when they happen. (It’s a good thing paddle shifters are included.) EPA fuel-economy estimates for this powerteam are 23 mpg in city driving, 29 on the highway, and 25 combined, but this tester’s 150-mile tour (with 65 percent city-type driving) worked out to an underwhelming 21.2 mpg, even with the standard start/stop function in use much of the time. 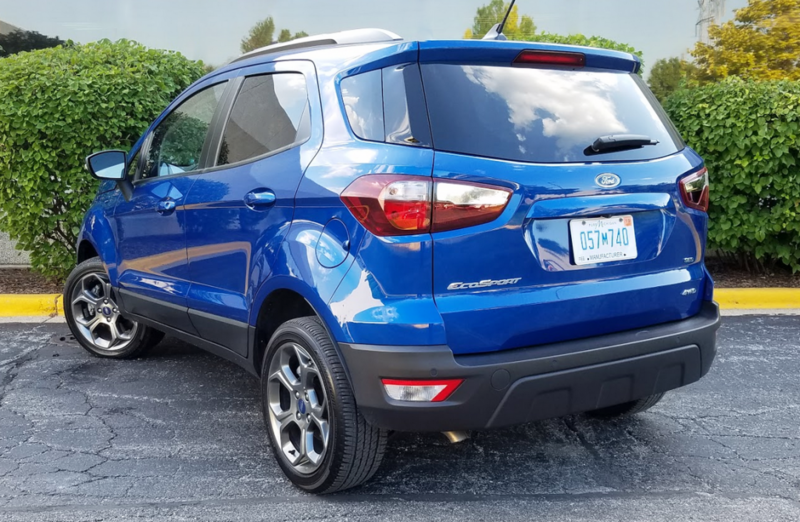 EcoSport is the tiniest member of the subcompact crossover-SUV club. 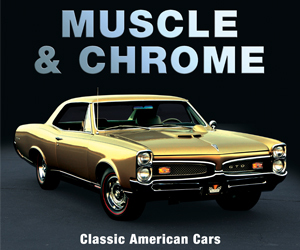 Overall length is just 161.3 inches and the wheelbase spans a mere 99.2 inches. Maneuverability benefits from these minimal dimensions—and a lot more parking spaces open up to a vehicle that small—but ride suffers. AWD models have a fully independent suspension, with MacPherson struts and a stabilizer bar in front, multiple links with a stabilizer bar and progressive-rate springs in back, and hydraulic gas-pressurized shocks all around. With the firmed-up SES suspension, the test vehicle had decent composure in cornering but ride was subject to passenger-jostling upsets on even moderately distressed pavement. Provided a handpicked team of passengers all of about 5’-11” or shorter is selected for each trip, four adults will fit into an EcoSport reasonably well. However, if any one of them gets any big ideas about being taller, it is going to throw off the seating-space balance. Front seats are comfortable and moderately supportive, but the cushion of the rear bench is quite flat. Back-seat passengers may get an impromptu physics lesson during cornering. 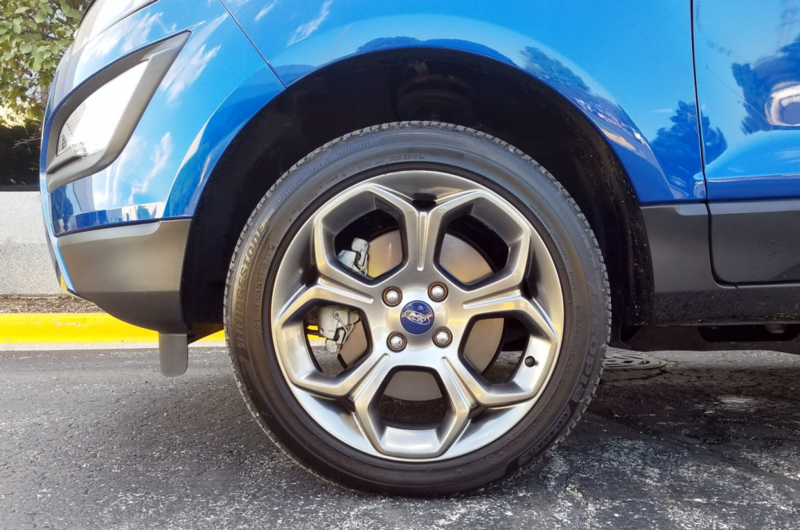 Seventeen-inch “Dark Tarnish Metallic” painted aluminum wheels are standard equipment on EcoSport SES models. The coppery seat striping and dash and console doo-dads inject some warmth into otherwise stark surroundings. There’s a bit of soft material on the upper part of the instrument panel, the door centers and armrests, and the console-box lid. Controls are legible and well placed. Audio settings are quick and easy to pick out thanks to volume and tuning knobs, and presets are saved in a snap on the Sync 3 touchscreen. Using the climate system is similarly convenient: Temperature and fan speed are directly adjusted with rotary knobs, and Ford literally draws you a picture (of a seated figure) to select high-level, mid-level, and/or floor-level vents to deliver heating or cooling. Interior-storage spaces are generally small. A big lid covers a glove box with a petite bin—at least there’s an upper slot to hold the owner’s manual. The console box is also limited, though it does have a suspended tray handy for small, loose items. The console has a couple slight open spaces, a forward bin next to a 12-volt plug and two USB ports, and a pair of cup holders. Small map pockets with bottle holders are in the front doors. Second-row storage includes pouches on the backs of the front seats (plus a tiny pocket near the top of the passenger seat), cup holders in the central armrest, and bottle holders in the doors. A side-hinged doorgate lends access to the small cargo hold. Big hauling jobs require retracting the 60/40-split rear seat backs. However, the floor panel is adjustable and can be set to three levels. One cants the floor to match the angle of the folded seats, while creating a substantial hidden storage area beneath it. To permit the seat backs to fold flatter (and align with the “normal” height of the cargo floor), the rear seat cushion can be flipped up out of the way, albeit at some loss of front-seat room because they’ll have to be moved forward to accommodate the cushion. 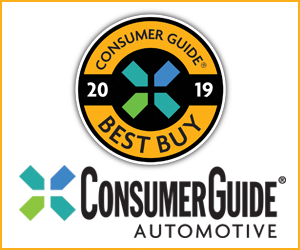 If, as announced, Ford wants to put greater emphasis on crossovers in the coming years, it will be essential to have a subcompact that does more things better than the EcoSport currently does. 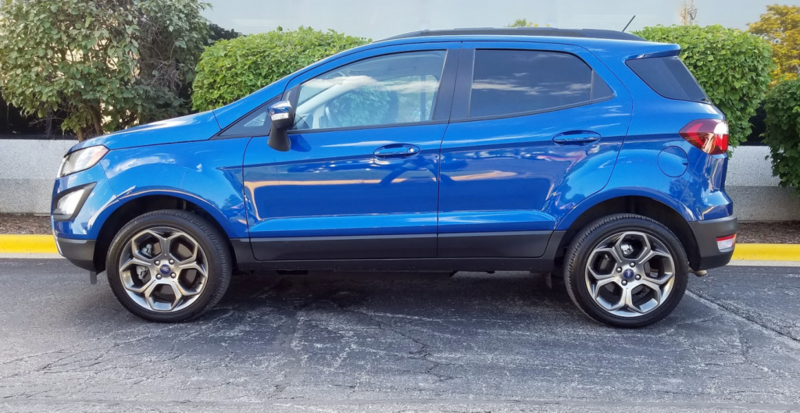 Its spunky character, easily-parkable size, and all-wheel drive have their charms, but most class competitors best the EcoSport when it comes to available safety features, powertrain refinement, interior room, and fuel efficiency. Written by: The Daily Drive staff on November 14, 2018.